THE DISCOUNT AND AFFILIATE PASS. On the back of the pass, write your name, surname and start date in the spaces on the back. 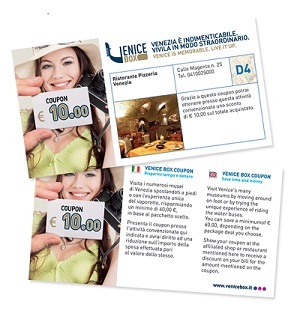 The VeniceBox affiliate pass is valid for three months from the date you have written on the back. The pass will automatically activate when you use it the first time, and it will be valid for the period shown on your VeniceBox package. The museum pass is a voucher that you need to exchange on your first admittance to a museum, which will permit you to skip any queue. Hand it to the ticket office staff, and you will receive all of the tickets it warrants: we suggest doing this at the Correr Palace point, which is the most accessible. With the tickets you receive, you'll gain admittance to all of the museums, without having to stand in line. Validity and use of the passes. 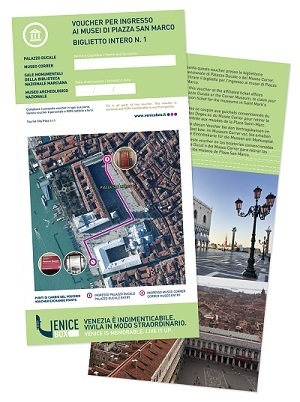 All of the passes contained in VeniceBox are valid for 12 months from the purchase date and so must be collected and activated within this period. The AFFILIATE PASS is valid for three months from the starting date shown on the pass. Just show it at any affiliated attraction or store to get your discount. The MUSEUM PASS is valid for three months from its activation date. Just show it at any affiliated museum entrance to skip any queues and be admitted immediately. The TRANSPORT PASS is valid for the days shown in the package you buy, starting from the moment you first use it. Just hold your pass near the reader units installed at the water-bus stops or on city buses. This means that regardless of the start date shown when you actually buy the pass, your VeniceBox will be activated only when you actually start using it on public means of transport. Thus, your transport pass will be valid for the amount of days you have bought. Please note that the valid days are calendar days. This means that if you start using your pass at noon on a Friday, that Friday will be the first day of your pass. The transport pass is valid on consecutive days. At the end of the validity period, the pass will expire and it will no longer be accepted free on public means of transport. If, for example, the pass on a three-day validity package is first used on a Wednesday, it will expire at midnight on Friday, regardless of how much it was used. All that's left is for you to start enjoying yourself! If you arrive by train: all you have to do is get on the vaporetto water-bus to get to your hotel: public transport is always included! Skip any queues at the vaporetto stops, at any time, with no worries. While, if culture comes first on your list of priorities: go to the museum without having to wait in line. Whereas if shopping is your thing: there are over 50 affiliated stores at which you can buy souvenirs and mementos for friends and family. 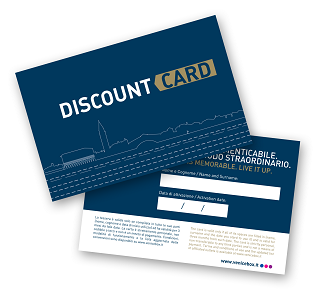 Moreover, the package also gives you a coupon worth €50.00! If you want to taste some of Venice's delightful dishes: pick one of the many affiliated restaurants. You'll save up to 10%. See! It's simple. Contact us and buy VeniceBox right away. di proprietà BBC Solution S.r.l.